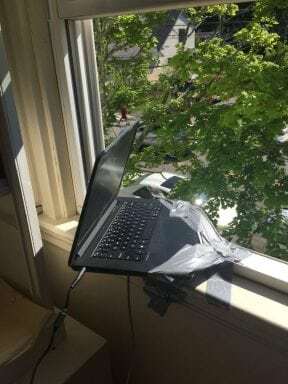 As Tim Gunn would say, I ‘made it work’ so I could live stream the Bar Harbor Fourth of July Parade as I promised by duct taping my 15 inch laptop out the window. Bar Harbor, Maine has an epic Fourth of July celebration. It starts with the local Rotary Club’s Pancake Breakfast, followed by the parade at 10 am, and an afternoon of activities that include a craft fair, lobster races, and the MDI Seafood Festival (and, for many, a very popular activity commonly called “shopping”). In the evening the Town Band plays opening act to an impressive fireworks show that caps off the day. In addition to these Fourth of July spectaculars, Bar Harbor also happens to be the town one of my coworking spaces is in. This year, I saw a few people in Facebook groups asking if anyone was going to livestream the parade. I had already agreed to volunteer the lunch shift at the Seafood Festival– and since I was coming into the fray anyway, I decided why not do something nice by coming in a little earlier and streaming the parade. Despite using computers all day in my work, I’m not much of a computer hardware person so I started testing an hour before the parade. It took me a bit to figure out that I couldn’t use the amazing camera on my iPhone 6 for a continuous Facebook Livestream because the connection kept resetting. After a few false starts (with people watching), I realized I could use my laptop camera and plug that directly into our network so I didn’t have to worry about WiFi. Once it was working, I duct taped my whole setup halfway hanging out our window. In doing this, I figured out why people hadn’t offered to do it: it’s a pain. You need good internet, good equipment, a good power supply, and a good location. I told them that Friends of Acadia was also livestreaming, linked to both pages, and posted that if they ‘liked’ either page, they’d get notified when the broadcast started. A little salesy? Yup. Instructive and useful though for people unfamiliar with Facebook Live? Absolutely. Here’s what I was reminded of: when you go out of your way to do something people are asking for that no one else seems to want to do, they appreciate it. Now these weren’t just 25 Facebook likes I bought off the internet but real people connected to Bar Harbor–whether living here or coming regularly on vacation–the exact people I want to know about Anchorspace. This group’s first interaction with us showed them that I was resourceful, fun, and tech savvy. We also generated a lot of goodwill. People watched from other states, wishing they could be here. One woman recovering from an illness wasn’t able to attend but was grateful to watch. While these types of goodwill are not measurable, they are still worthwhile. In other words, I think it’s always nice for us to look around our communities, our markets, our lives and see where people are asking for things without people providing them… and if we can help, we should. It’s our responsibility as people to make things easier for others… and if we make a few sales or get a few Facebook likes in the process, that’s ok too. My friend Ryan Pelletier became the town manager of Madawaska within the last couple years. One thing I’ve noticed since he took this position is how he uses Facebook in particular as a way of reaching the masses. He also has a really straightforward approach (sound familiar?). We decided to ask him how he used social media as a tool to do his job better. We’ve included some of Ryan’s posts as examples in hopes to inspire others looking at this post of what kids of information they can share. I see you use your Facebook profile to communicate messages about what’s going on, including changing town office hours or moving public restrooms. What makes you use your personal profile versus an official company page? For me, I’ve been doing this kind of work for a long time and have amassed a lot of friends and contacts on my personal profile. We have toyed with the idea of an official town profile, but I feel that folks follow me and are used to getting info from me via my personal page. My next plan is to start communicating some of the Town’s notices (meetings, elections, flyers about events etc.) via SnapChat for a younger demographic. I will probably use a town Snapchat account for that instead of my personal one, but I haven’t figured out how to set that up yet. 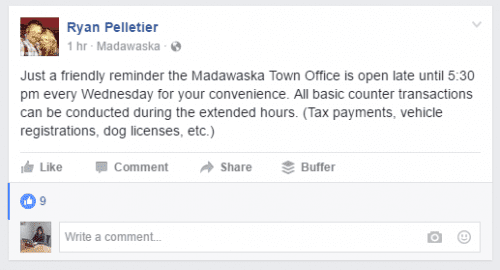 How has your openness changed the way people perceive town government and the Town of Madawaska in general? People by and large seem very pleased with my style of open communication. Town Government (and really all government) should be an open book. Not everyone will agree with what I or the Town leaders decide to do, but that’s ok. At the end of the day, I have to remember, it’s their town, I just work for them. 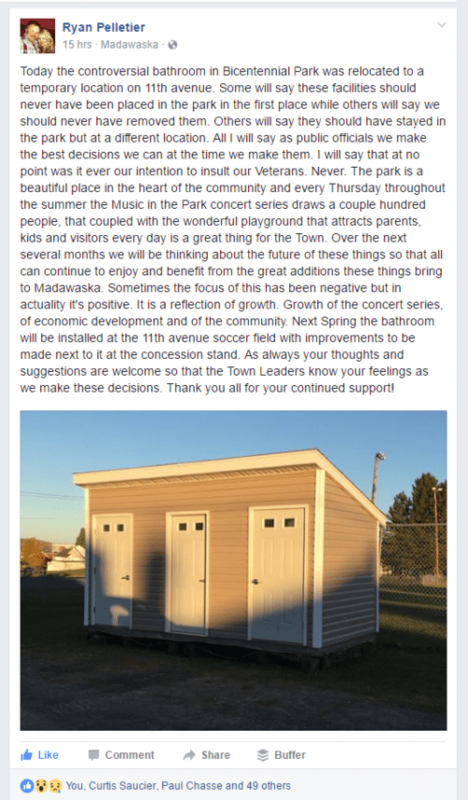 I also get a lot of compliments from local folks both in and out of Madawaska that have said they notice a huge difference in the perception of Madawaska. That’s the best compliment I can get! What is the most surprising interaction you’ve had on social media about community development? Not specifically community development, but, when we were considering the drug testing for welfare proposal. That was very eye opening about the strong opinions both for and against. I got to see lots of opinions expressed from throughout the State on that one. Do you have any advice for town governments looking to use social media to promote understanding and interaction? Social Media is not a lot different than regular media in my opinion. I always say it’s better to control the message than let others control it for you. Just like when I issue press releases or do interviews with the local news, it’s about getting ahead of the curve and letting the people know directly what is going on. So the advice is, keep the message simple, honest and straightforward. Don’t be afraid that your opinion will be opposed. It’s all good!